Jan 1, 2019 Goodbye 2018, Hello 2019..
Sep 15, 2018 A Letter to God..
Sep 3, 2018 Always, Be Kind..
Jun 9, 2018 Who Are You Pursuing? May 14, 2018 Testing the Waters..
Jan 1, 2018 New Year New You, Right? Dec 25, 2017 Mary, did you know? The winter months can be long + hard when you’re a parent of littles. In our household if we have a choice between playing inside + playing outside we always choose outside, but the winter cramps our style. 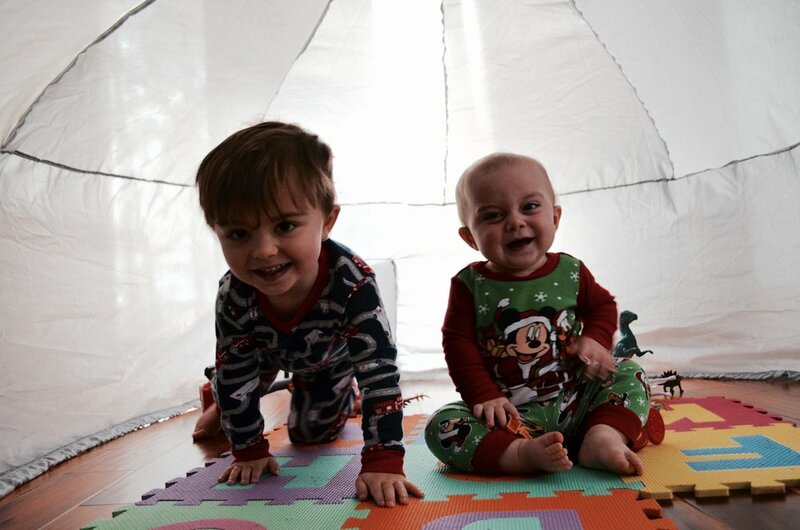 This was my first winter with two kids two + under and its been challenging to say the least. We still try to bundle up as much as possible to keep our sanity + a partially clean house to have outdoor time. But on the days its just way to cold we have a few favorite toys I wanted to share. If I’m honest, these toys are used year-round, I just feel like they get used more in the cold winter months + hot summer days. Our normal days consist of staying in our jammies a little too long, taking baths as entertainment or distraction from boredom, + making way too many baked goods. And unfortunately, too many movies. Below I will show pictures + describe a few of our favorite toys with links to purchase! So Ezra is my child that loves to hide; and unfortunately not the hide + seek where moms gets a tiny break in-between each hide. He wants you where he is + engaged with him at all times. I’m really not complaining though, I love this age + I'm sad its passing by so quickly. 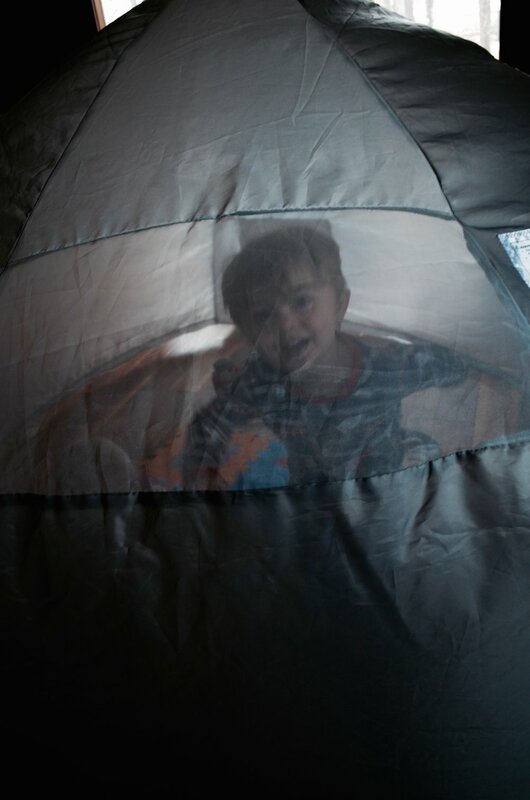 But back to hide + seek…Everyday, day after day, we would have to go hide under the covers in our bed while he played. He could entertain himself for an hour straight (with mom + baby under there of course). It would always get super hot, because we weren’t allowed to have any outdoor(light and air exposure) cracks, per Ezra’s request. Also I don’t have the best posture- so crouching under the covers killed my back + neck. When I came across this on Instagram I immediately texted my husband + asked if it was ok if I got myself an early birthday gift. Of course he said yes having no idea I meant another toy for the kids. This fort is the best thing ever! I feel like this needs to be in every kids playroom! It comes in a tiny bag, which is great for storing when not in use. All you need to purchase separately is a box fan. 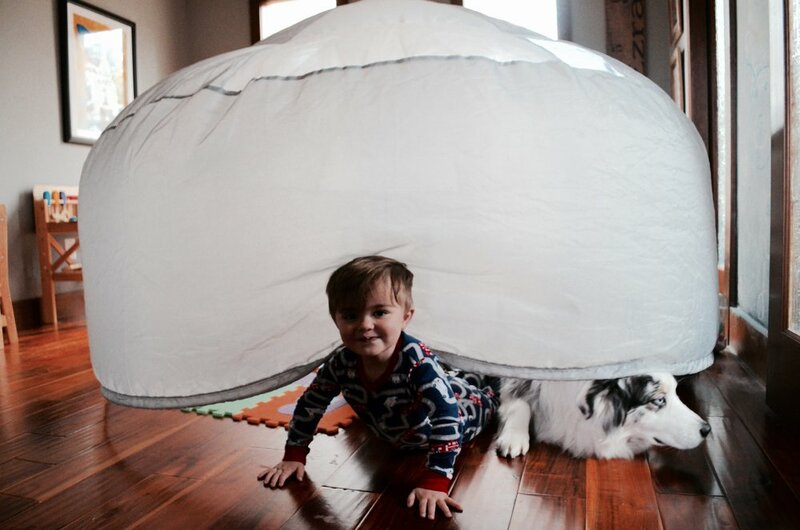 You hook the fan to the fort + boom your kid’s imagination takes it from there. I love it, because there is plenty of headroom + it’s constantly breezy from the fan. Don’t worry, there’s a mesh guard so the kids don’t get any ideas about playing with the fan- a fear of mine. It is super easy to access in + out. Even our dog Luna has figured out how to come in + out. Ezra loves playing in our sand pit outside, but who wants a sandpit in your house?! This is the coolest thing ever. Zach joked + asked if we could buy enough sand for our outdoor sandpit. The sand doesn’t stick to anything but itself. Yes, you heard that correctly. THE SAND ONLY STICKS TO ITSELF. And all the mommas said AMEN! In these pictures we have two packets of Kinetic Sand + a plastic storage bin to keep it (free of dog hair). We have mini heavy machinery equipment to play in + it fits perfectly in our container. Perfect for mom, because I don’t find bits + pieces all over our house. Who doesn’t love organized chaos?! 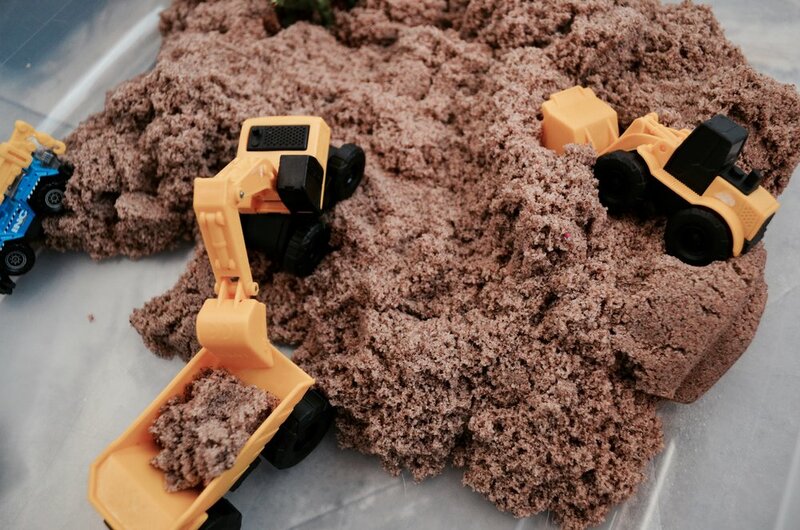 Ezra can build things in the sand pit + knock it over with his trucks for what feels like forever in toddler life. What kid doesn’t love to play with playdough? 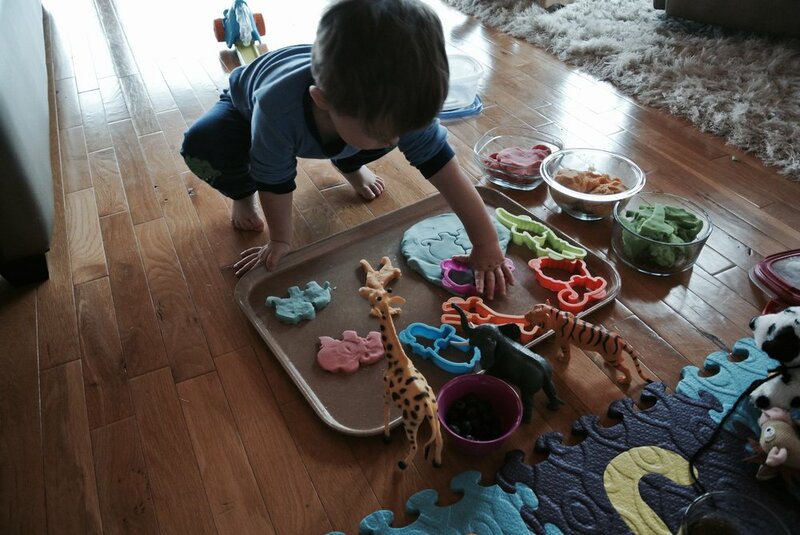 I try to be as intentional as I can on what products my kids play with + if I can make a healthier alternative I try! Plus Ezra loves helping me do any tasks, so this is a win-win in his book. Do we slack sometimes + play with name brand playdough..well yea, but it is nice to make our own sometimes! In small saucepan, pour the flour, salt, + cream of tarter. Keep stirring for 30 seconds to 2 minutes, depending on the heat of your stove. We are the Cashio's. Husband and wife with two little boys + one furry girl. Bearded man who loves working with his hands. Hairdresser turned homemaker. Airstreams have a special place in our heart.